The number of drug-induced abortions in Texas plummeted in the first full year after the state's strict 2013 abortion law took effect, according to statistics released Thursday by the Texas Department of State Health Services. The overall number of Texas abortions — which also includes surgical abortions performed in the state and on Texas women out of state — dropped significantly, the agency found. The 2014 Texas data was released days after the U.S. Supreme Court struck down the 2013 abortion restrictions as unconstitutional. In a 5-3 vote, the high court overturned provisions of House Bill 2 that required all Texas facilities performing abortions to meet hospital-like ambulatory surgical center standards and forced doctors to have admitting privileges at hospitals within 30 miles of the clinics. The significant drop in drug-induced, or "medical," abortions — to 4,938 in 2014 from 16,189 in 2013 — appears to have partly driven the overall drop. The overall number of abortions dropped to 54,902 in 2014 — down from 63,849 in 2013. While the annual number of abortions performed in Texas was declining before the new law took effect, the 14 percent drop from 2013 to 2014 was far more drastic than those seen in previous years. The drop is partly due to a separate provision of the new law that required doctors to follow FDA guidelines on medicines used for drug-induced abortions. Under those guidelines, the portion of women choosing drug-induced abortions dropped from 40 percent at both Whole Woman’s Health and Planned Parenthood clinics to 9 percent and 1 percent, respectively. The FDA updated its labeling in March — which had the effect of relaxing the Texas restrictions by reducing the required drug dosage, decreasing the number of visits a woman must make to the doctor and extending how long into a pregnancy she can obtain the drugs. Since then, women overwhelmingly have returned to choosing drug-induced abortions, providers said. In defending the abortion law, the state argued the strict restrictions were intended to protect women’s health and make the procedures safer. But the 2014 data confirms that few complications actually occur in abortions in Texas. Fewer than 1 percent of Texas abortions resulted in any kind of complication, including deaths among women obtaining the procedures. Lt. Gov. Dan Patrick extolled the drop in an interview Thursday with a Lubbock radio station. 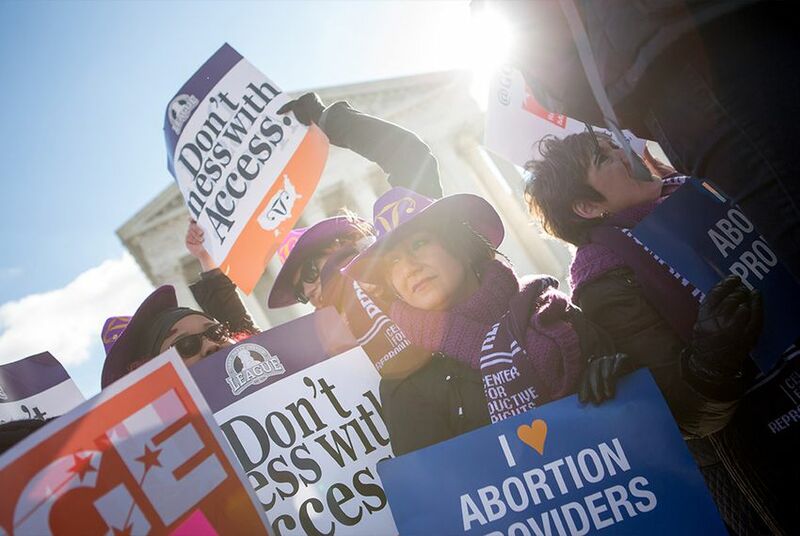 "You see the Wendy Davis crowd, the abortion crowd and the ACLU decrying these numbers. 'How terrible this is!' How terrible? Everyone, even if you're pro-choice, you ought to be celebrating life. There are about 10 to 12,000 2- and 3-year-olds running around today acting like 2- and 3-year-olds act because of this legislation," he said. "Our true purpose was to make sure the environments were safe for women, but obviously, if you end up as a result having fewer abortions and saving lives, that's something that everyone should celebrate." In the ruling striking major provisions of the Texas law, Justice Stephen Breyer cited a lack of evidence presented by the state and said the facility requirement did not "benefit patients and is not necessary." The 2014 data is of particular interest to both sides in the abortion debate because it details abortions in the first full year during which parts of HB 2 were implemented. It also reflects details of abortions performed in Texas as the number of clinics performing the procedure dropped significantly. In 2014, about 10,000 fewer abortions were performed in abortion clinics while almost 2,000 more were performed in ambulatory surgical centers. More than 40 abortion clinics operated in the state before HB 2 was passed. Eight clinics closed in anticipation of the law taking effect, and 11 clinics closed the day the admitting privileges provision took effect in late 2013, according to lawyers who represented the abortion providers that sued the state. Only 19 clinics remain open today, none of them operating in the hundreds of miles between San Antonio and El Paso. The newly released data also shows Hispanic women were disproportionately affected by changes to abortion restrictions in Texas. From 2013 to 2014, the number of abortions obtained by Hispanic women dropped by 18.3 percent, compared to 7.7 percent for black women and 6.7 percent for white women. The drop parallels closures of abortion clinics in predominantly Hispanic areas of the state. As clinics closed in Corpus Christi and Harlingen, only one South Texas clinic remained open in McAllen. The next closest clinic was in San Antonio. The delayed release of the 2014 abortion statistics came under scrutiny two weeks ago when the ACLU of Texas demanded DSHS release the 2014 abortion statistics after learning from a health agency insider that the state was concealing the information months after it had been finalized. The health agency insisted the data had not yet been completed. But a state employee, who requested anonymity to speak candidly about the department’s actions, revealed to the Tribune that the process of compiling the much-anticipated statistics had begun normally but hit a roadblock in February. Although the data was finalized, it was left “in limbo” for several weeks after it was sent to the agency’s legal branch, the employee said. Staffers were then instructed to stop referring to the abortion statistics in emails and to respond to public inquiries about the data by saying it was not final, according to the employee and to agency emails provided to the Tribune. The Texas ACLU contends the agency decided to withhold the data to mask the effects of HB 2. The state agency is not required to publicly release the abortion statistics, but it has done so annually.